Many students come to school with social, emotional, and mental health needs that affect them academically. Secondary students face unique emotional challenges within the academic setting, including relationship concerns, bullying, gender identity, social media, and other traumatic experiences, that could adversely impact them. In addition to addressing academic and behavior needs, the response to intervention (RTI) service delivery model encourages interventions to address the social and emotional needs of students at the secondary level. Although many individuals (e.g., teachers, coaches, principals) provide guidance to students academically, socially, and emotionally, school counselors possess the integral skills and training to support students in all these areas and to collaborate with others to address their needs. 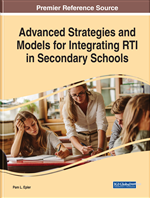 This chapter focuses on the secondary school counselor's role in supporting the RTI process by providing a tiered system of mental health support through collaboration and implementing other effective interventions. Response to Intervention (RTI) is a framework designed to ensure that the academic, social-emotional, and behavioral needs of students are met. RTI focuses on prevention and intervention to resolve barriers to student learning and success. Interventions should be based on assessment and should be aligned with practices that support student needs. In the academic setting, school counselors can play a key role in the RTI process. According to the American School Counselor Association (ASCA) Position Statements, the school counselor’s role includes providing all students with a standards-based school counseling core curriculum to (a) address universal academic, career, and social-emotional development; (b) analyze academic, career, and social-emotional development data to identify students who are struggling; (c) identify and collaborate on research-based intervention strategies implemented by personnel in the academic setting; (d) evaluate academic and behavioral progress after interventions have been in place; (e) revise interventions when appropriate to address the needs of students; (f) refer to school and community services as appropriate; (g) collaborate with administrators, other school professionals, community agencies, and families in the design and implementation of interventions; and (h) advocate for equitable education for all students and work to remove systemic barriers to students succeeding (ASCA, 2018). This chapter discusses many of the interventions and methods that school counselors use within the academic setting to support these eight areas identified by ASCA. In a more general sense, school counselors are professionally trained to address the social-emotional needs of Pre-K to 12th-grade students in the school setting, thereby ensuring that students are ready to learn, work successfully with others, and plan for a postsecondary life of either a career or further education. At the secondary level, students possess unique challenges that must be addressed to support them socially and emotionally. Due to various concerns, such as bullying, gender identity, postsecondary preparation, and relationship concerns, social and emotional consideration must be embedded in secondary schools. This is accomplished through schoolwide, classroom, small group, and individual services. Social and emotional learning (SEL) is a developmental process that begins at birth and continuously develops throughout the lifespan. School counselors are trained to provide developmental services to students at the secondary level as they move through the daily academic and social challenges of growing into a young adult and attending school. In the same manner that students need to learn academic content to become successful adults, they also need social skills and self-understanding (e.g., emotion regulation, self-soothing skills, conflict resolution skills, reciprocity, personal responsibility, goal-setting and time management, self-assessment skills, and the ability to find resources to assist in personal growth). School counselors know how the adolescent brain development impacts social and emotional skills and how to work with students according to grade band and individual developmental needs to best support the student. When a student is referred to a school counselor, the counselor first assesses the needs and abilities of the student. This means looking beyond “the problem.” For example, a student might be referred to a school counselor because she is disruptive in the classroom during teacher instruction (the problem). The school counselor begins by talking with the teacher to collect data—the when, where, and why of the problem. The next step is to meet with the student and to observe the behavior as it is occurring in the natural environment. Once armed with this information, the school counselor can better understand the root of the problem and develop an intervention plan based on the individual student’s developmental level and make it specific to the setting where the behavior occurs. This is often a collaborative process that includes student, teacher, and parental input on both the problem and interventions tailored to the student and teacher’s needs. Interventions in this case relate to discovering the root of the problem (what is the trigger for the behavior and what skill is the student lacking) and matching the root of the problem with developmental interventions (teaching the student knowledge, deeper self-understanding, and new skills such as how to successfully handle the unwanted behavior; learning new behaviors; or learning new coping mechanisms). Mental Health: The ability for one to cope with normal life stressors and factors that could impede one socially and emotionally. Wraparound Process: Intensive, individualized intervention process carried out by a team of stakeholders. School Counselor: A master’s level mental health professional in the school setting who addresses social, emotional, and academic barriers for all students. Tiered System of Support: Multiple layers of interventions to address barriers for students in the academic setting. Collaboration: The process in which two or more people and/or organizations come together to address a common goal. Social and Emotional Learning: The ability for students to be aware of their own emotions, to self-regulate, and to empathize with others around them.